Below is a pic of the little Jammy Dodger from my son's afternoon tea stand that inspired this. I'm glad the server told us the name of the biscuit so that it stuck with me in a fun way. Traditionally, the biscuits are cut with a heart-shape cutter for the opening but since I didn't have one in the right size, mine were cut with a flower shape. For these small-size cut outs, look for fondant cutters. It's probably fitting that I used a recipe from Paul Hollywood because I watched quite a few hours of The Great British Bake Off on the flight home from London (the contestants always amaze me). I was a little nervous about making this dough, which is similar to preparing a sweet tart crust dough but it's actually pretty simple. To start, rub small dices of butter (I used chilled but not super cold butter) into the flour, icing/confectioners' sugar and salt until the mixture looks like breadcrumbs (British scones are often made in a similar way, by working butter into the dry ingredients to a breadcrumb texture). You don't want any large lumps in the mixture - you are looking for a rather uniform breadcrumb consistency. I've seen recipes that use either confectioners' sugar or caster (superfine granulated) sugar. Personally, I really like the silky texture powdered sugar gives shortbread cookies. Then add an egg yolk and work it together to form a dough. It might not look like it's going to happen but it does. Turn the dough out onto a lightly floured surface and knead the dough gently to form a smooth ball. Wrap and chill for at least 30 minutes. If you chill it for longer than 30 minutes like I did, you'll find the dough hard and will need to let it sit at room temperature to soften a bit to work with more easily. Then, roll the dough to a thickness between 1/8 to 1/4 of an inch. Cut out shapes using a fluted or round cookie cutter and then cut out a smaller opening in half of those to use as tops to the sandwiches. My cutters were about 2 - 2 1/2 inches wide and this recipe (half the original) yields about a dozen sandwiched biscuits. Chill the cut dough again for about 30 minutes before baking (you can do this a day ahead, wrapping the dough tightly and storing in the refrigerator). Bake the cookies at 325 degrees until they are just starting to turn color at the edges. The cookies should be pale when done. For an optional sparkle (like the one at Fortnum & Mason), remove the cookies about 2 minutes before they're finished baking and sprinkle the cut-out tops with sugar (I used superfine, or caster sugar, which is often called for in British baking). I left a few without sugar and I preferred the appearance of the ones with it. Once cooled, it's time for the fun part. Add a small dollop of jam (or Nutella) to the center of the bottom halves and spread it slightly. Then place the tops on each and gently press together. You want the filling to go almost to the outer edges. I covered a few bases with strawberry jam, apricot jam, and Nutella. The Jammy Dodger at Fortnum & Mason's was filled with raspberry jam. Had I any raspberry jam on hand, I would have loved to use it. I also enjoyed some delicious lemon curd at tea and I think that would be wonderful as a filling as well. 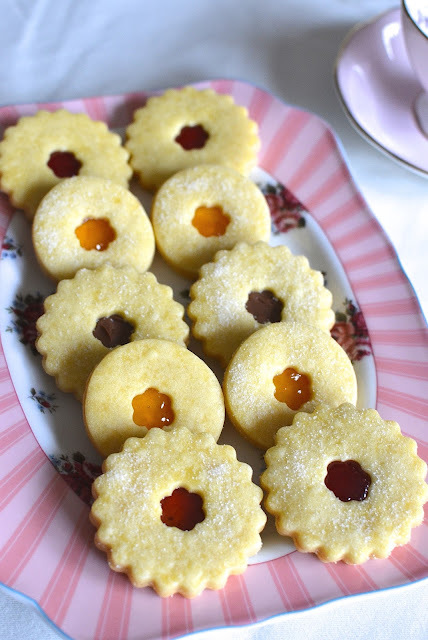 These homemade Jammy Dodgers are delectable. It highlights the simple goodness of butter and sugar, somehow creating a crumbly, melt-in-your-mouth cookie (I mean, biscuit!) that's enhanced with the vibrancy of a touch of jam (or chocolate) in the center. I can see why Jammy Dodgers have been a favorite among the Brits for so long. Simple ingredients - and classic flavors - often make the loveliest treats. Place flour, confectioners' sugar, and salt into a mixing bowl. Add butter and rub ingredients together until the mixture resembles breadcrumbs. 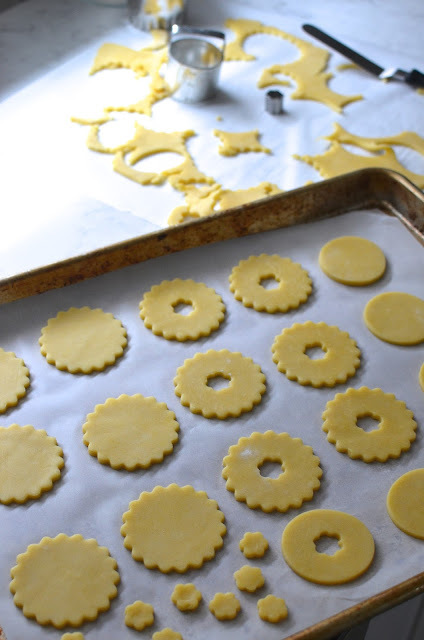 (You can start with a pastry cutter, then continue with your fingers. You are looking for a uniform breadcrumb texture, without any large lumps.) Add egg yolk and bring together to form a dough. Turn the dough out onto a lightly floured surface. Gently knead together to form a smooth ball. Wrap the dough tightly with plastic wrap and refrigerate for at least 30 minutes. Line 2 baking sheets with parchment paper or silicon baking mats. Turn chilled dough out onto a lightly floured surface (you might need to let the dough sit at room temperature to soften slightly before rolling). Roll the dough out to a thickness that's between 1/8 to 1/4 inch thick (somewhere in the middle will do the trick). Cut out rounds using a cookie cutter, re-rolling the scraps once. Using a smaller cutter, make an opening in the center of half of the cut-outs. Place biscuits onto the prepared sheets and let rest in the refrigerator for 30 minutes. Bake biscuits for 12 to 14 minutes, until they are just beginning to turn color at the edges but still pale. (If desired, remove the cookies from the oven about 2 minutes before they are done and sprinkle the top halves with sugar, then return to the oven to finish baking.) Remove from the oven, let biscuits sit on the tray a few minutes to firm up, then transfer the biscuits to a cooling rack. Once cooled, turn the whole biscuits over upside down and top the middle of each with a dollop of jam (or other filling), spreading it slightly but not quite to the edge. Top each with a biscuit that has an opening and gently press together. Enjoy! Ain't these biscuits adorable! I used to love this as the cheesecake crust...so good! Shortbread crust on a cheesecake makes total sense. I was watching a show featuring a dessert like that and it had lemon curd in it...how perfect is that! Thank you very much. My son sure is a fan of the Nutella twist. These are so perfect!! They are just beautiful. Thank you, Ashley. Great excuse to make more cookies. I mean...biscuits! Your cookies are fantastic - the dough looks absolutely amazing! What a fun trip with the family and I love that you recreated your afternoon tea. Since I started working from home, afternoon tea is a daily event, even though I don't have cookies like these to enjoy. You're such a great mom - and I hope you'll share some photos of your trip! The cookies look perfect! I was just thinking that they look very much like the Linzer Torte cookies I make around Christmas time and then I saw you mentioned that too. :) And London! How I wish I was there right now... I love it so! Monica, you have gone all out on these cookies. So delectable and perfect for a spring brunch or high tea! Thanks - so loving the tea theme right now. You're right, Juliana. As easy as these recipes are really, it does take a certain amount of patience that I have to admit I don't have sometimes either. : ) It's good to be motivated though and I was happy for this inspiration. Love how pretty and delish these jam filled cookies look. My daughter love jam cookies and after seeing your post she wants me to make them for her. Can't wait to try these cute things for her. Thank you for lovely recipe. I love a Jammy Dodger and I bet homemade ones are so good! I want to try a packet of them. : ) Thanks, Caroline. Linzer cookies have long been a very very favorite of mine! 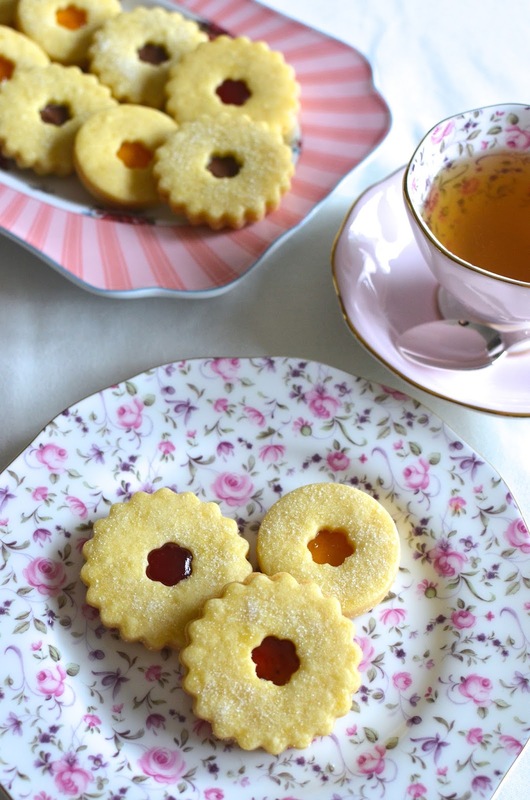 I've never heard of jammy dodgers before (so interesting!) but now I sooo need to give these a try! And what a cool experience with the tea! I know we both love anything with almonds/nuts...but these simple shortbread cookies are great, too. Something about the simplicity of butter and sugar...and I really like the texture from using powdered sugar. I've never had a proper afternoon tea but this certainly sounds like a great experience. The jammy dodgers look delicious. I bet the Nutella ones were delicious too. London is on my bucket list. Yummy ! so delicious ! I love the simplicity of this recipe. They look buttery and delicious! Yes, what a beautiful city London is! We had a great time...the little man didn't want to come home. Glad you like the cookies...I get nervous making anything that needs to be rolled out/shaped but these were simple. Hope your week is going well, Kelly. Love Jammy Dodgers!Your variations are so lovely and the trip sounds wonderful. I hope you can visit Sydney one day. I can't speak enough of how gorgeous the afternoon tea culture over here is. 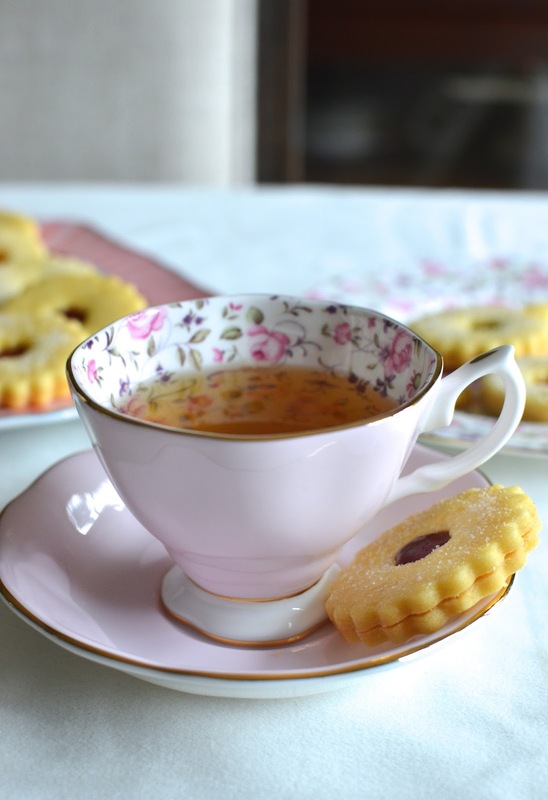 Wouldn't it be amazing to catch up over tea and biscuits? These are so pretty! I'd like one of each please. Hope to get to London someday too! It's fun to make a "pretty" cookie once in a while. : ) London was lovely; I'm sure you'll find your way there one day.